Jugaadu Internet: The Giant is No More - Tony Greig! The Giant is No More - Tony Greig! I felt like I was assaulted when I came to know that Greig is no more. Anthony William Greig who came to India in the 72-73 English team as the vice-captain to Tony Lewis. All Indians were fascinated by his height of 6 feet 6 and a half inches. 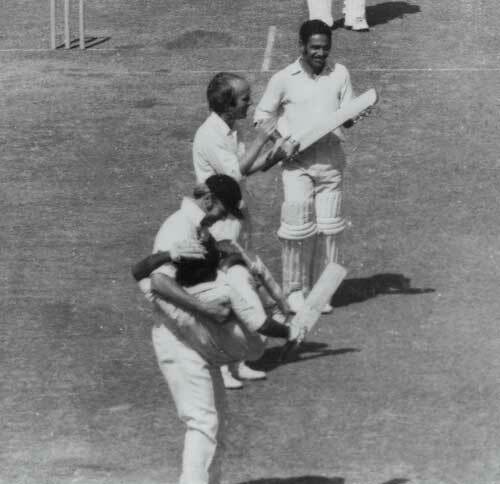 He became the most popular player in that series when he lovingly picked up our dimunitive maestro Gundappa Viswanath, in a bear hug, after GRV scored an attractive 113 at Mumbai. Tony Greig was a colorful character and a great all rounder. He was not liked when he revealed his seemingly mercenary side to actively campaign for Kerry Packers brand of cricket in the late 70s. The present lot of cricketers should thank him for the millions they earn today. Ask Gavaskar what he got paid for playing test matches when he was playing his last test and you will realize what people like Greig have done for cricketers. One of the best brains in the cricketing world, he went on to become one of the most popular and better known voices on the television. It is painful to learn that cancer has claimed another victim. Our best wishes for a fast recovery to another great suffering from cancer, Martin Crowe, who can rightfully be conferred with the title - 'father of T-20'. Another cancer afflicted gentleman is Robin Jackman who deserves our best wishes for a rapid recovery. Our best wishes too for our own Yuvi who has recovered from cancer and has made a come back to the Indian team. Did you see his magnificient hitting yesterday? Not for nothing was he called ' the Gary Sobers from India'.